Organizing a closet doesn’t have to be expensive. I love the beautiful closet systems they sell at home improvement stores, but I can’t afford to spend hundreds of dollars so I know where to find extra toilet paper. Last weekend while I was at my parents house, my mom and I found time to do a little budget-friendly organization project in her linen closet. They’ve lived in their new home for about a year and a half, and she’s still working on the perfect spots for everything. 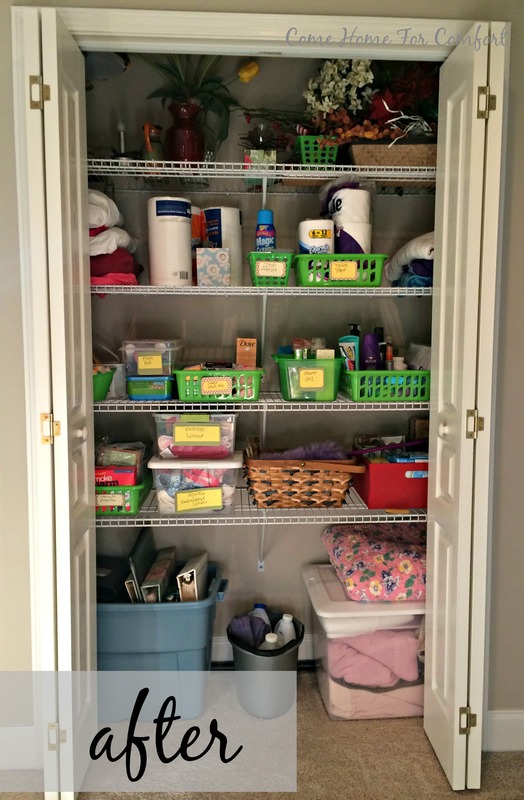 This closet is upstairs with all the bedrooms and is perfect for backup toiletries, paper products and a few cleaning supplies that are used in the rooms up there. 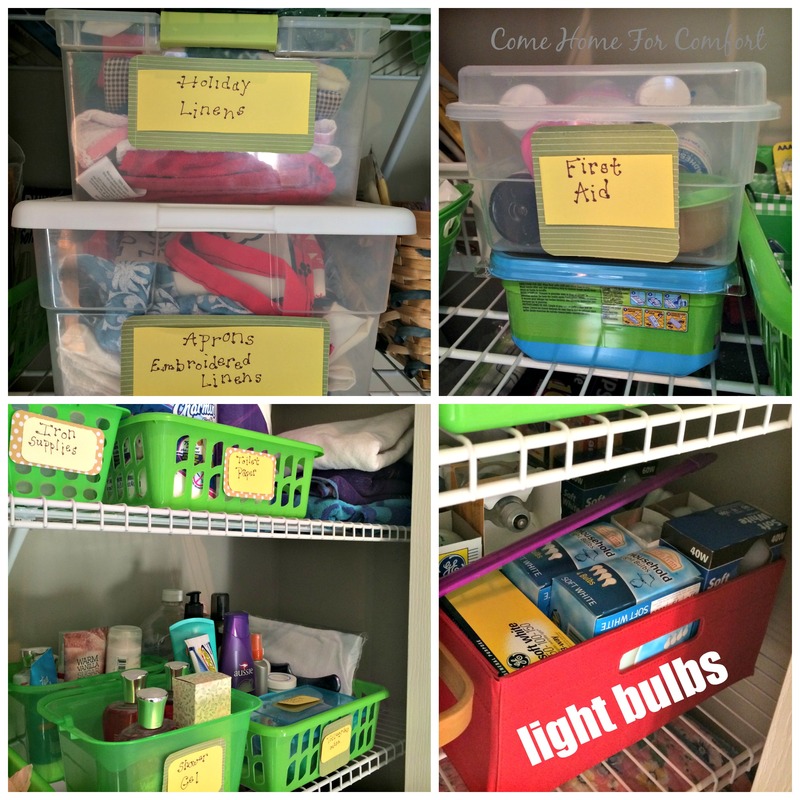 I love these large bins – they fit perfectly on the shelves. 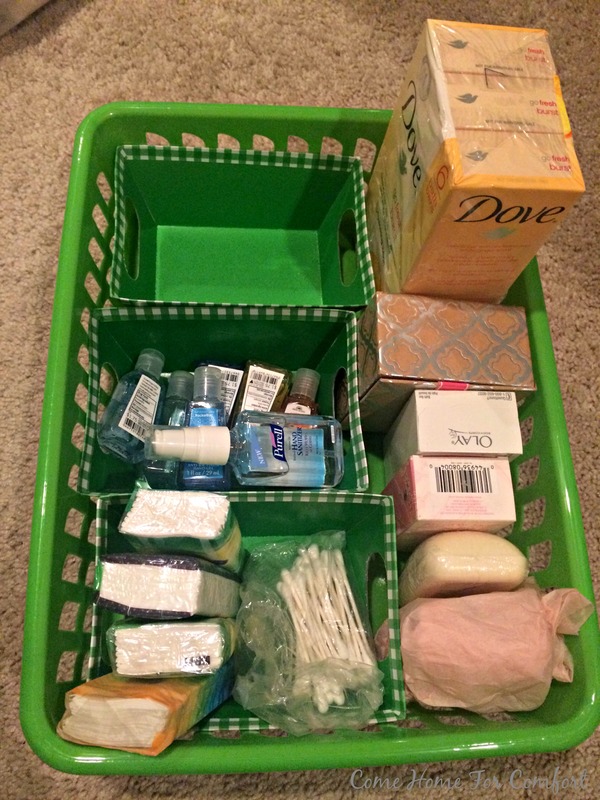 The green and white checked bins (3/$1!) fit nicely inside the large ones to corral smaller items like hand sanitizers. We both enjoyed admiring the completed closet throughout the rest of the weekend. There’s so much satisfaction from a freshly organized space! If you are visiting from RefreshHer, thanks so much for coming! You did a wonderful job organizing. My linen closet could use some help, but there are other areas in worse shape. 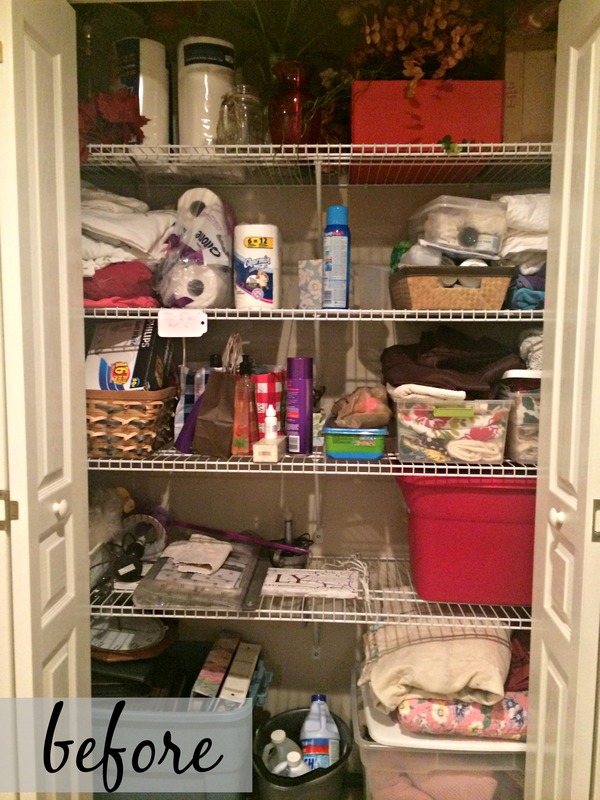 The craft closet, for example… I loved your tip about leaving more space than you think you’ll need. Makes so much sense! Thank you! The “leave room to grow” concept has revolutionized the organization process for me. I feel your pain with the craft closet. I have two of them and sometimes I’m afraid to open the doors because something might fall out. The rest of my house is pretty organized, but the craft room is a disaster area! Looks great! I think the labels make all the difference to create a cohesive look. I keep random storage baskets and bins stashed away because I never know when I might need them to organize a space! Thanks, Emily! I agree with you about the labels – they make a huge impact! Looks great! I love that you worked with what you had and just bought a few new things. That seems more practical than spending lots of money to buy all new containers. Good idea. I love those little green and white bins. Looks perfect now!! I love a nicely organized space, it is just keeping it that way that can be my problem. That might mean the organization system isn’t really working for you! I find that leaving room to grow is a huge part of keeping spaces organized. If I have to cram my stuff back where it goes, I’m less likely to keep up the organization. Try giving yourself more room than you think you need!